14 the advertizer March Fri 2 Feb - Fri 2 Ma r c h Carrick Nights - Alison McNeill & Sacha Savaloni Carrick Centre, Main St, Houston 8pm Alison (soprano) and Sacha (guitar) perform a variety of Spanish, Latin American, French, Italian, Contemporary and Scots Song repertoire. They have performed recitals in Spain and throughout Scotland at various prestigious events and are passionate about expanding and enriching the repertoire for voice and guitar and transcribe a lot of music for their performances. Ticket Prices (single concert): Adults £12, Children/ Student £5. Call 01505 229597 or e mail thecarrickcentre@gmail.com Th u 1 - Th u 15 Ma r c h Rosemary Beaton Art Exhibition No. 9, George Square Glasgow G2 1DY 10am to 6pm A large retrospective exhibition. Opening times Mon - Fri 10am - 6pm Th u 1 Ma r c h Outlook Kidston Hall, High Street, Kilmacolm 2pm to 4pm ‘Music on piano and violin’ with William Kean St Columba’s School Open Day St Columba’s Junior School, Knockbuckle Rd, Kilmacolm 9am to 3pm There is no better way to experience the true atmosphere of St Columba’s School than to come and see it for yourself. Open Day provides the perfect opportunity for prospective and current families to see our Early Years, Junior and Senior Schools in action. Please do come along from 9am- 3pm and let our pupils show you what makes St Columba’s so special. www. st-columbas.org Fri 2 Ma r c h Kilbarchan Fairtrade Group Curry Night Bobbins Cafe, 25 Steeple Street, Kilbarchan 7pm Last minute tickets may still be available at Bobbins. Local Lepidoptera - Moths and Butterflies of Glasgow McMaster Centre, Donaldson Drive, Renfrew 7.30pm Richard Sutcliffe will deliver an illustrated talk entitled “Local Lepidoptera - Some Butterflies and Moths of the Glasgow area”. All welcome. Fri 2 Ma r c h Carrick Nights - Kentigern Quartet + Maria Wilson and Accompanist Carrick Centre, Main St, Houston 8pm Works by Beethoven, Haydn, Brahms, Mendelssohn, Dvorak, Britten and Ravel. Recent performances include Glasgow cathedral, St Mary’s Cathedral, the BBC Club at City Halls, Renfield St Stephen’s, and the Drake Chamber Series in Glasgow. Come along and enjoy a varied selection of music. Ticket Prices (single concert): Adults £12, Children/ Student £5. Call 01505 229597 or email thecarrickcentre@gmail.com Fri 2 - Sa t 3 Ma r c h SAMA 2018 Paisley - various venues Scottish Alternative Music Awards 2018 Paisley Takeover Friday 2nd March 19.00 – 22.00 Paisley Arts Centre Acts: To Be Announced Saturday 3rd March 13.00 – 14.30 Paisley Arts Centre Music workshop with The Vegan Leather 16.00 – 17.30 Paisley Arts Centre Music Seminars 14.00 – In conversation: Speaker TBA 15.00 – When is the best time to showcase your music to the industry? 16.30 – How do you DIY in 2018? 18.12 – 19.00 Feel The Groove, Record Store SAMA Live Sessions: Acts TBA 19.00 – 22.00 Paisley Arts Centre Acts: To Be Announced Sign up via Eventbrite UK. Evening tickets include a complimentary drink on arrival (over 18s). For more info visit officialsama.co.uk Fri 2 - Sun 4 Ma r c h OK Fest Kilmacolm Old Kirk, High St, Kilmacolm A weekend community event, in association with the Old Kirk, celebrating music and the spoken word. 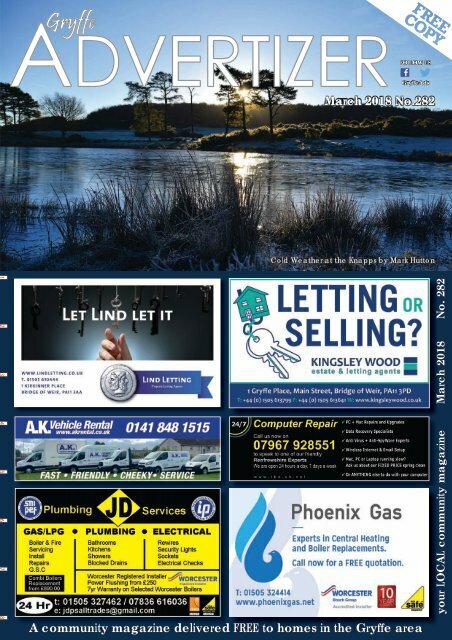 Programme details on Kilmacolm & Quarriers pages. (p36) Sa t 3 Ma r c h MND Coffee Morning Kilmacolm Community Centre, Lochwinnoch Road, Kilmacolm 10am to 12noon 2nd Floor. All welcome. Cost: £3 Curry and Quiz Night Scout Hall, Kilmacolm 7.30pm Tickets £10 which includes your curry. There will be a bar on the night selling beer, wine, spirits, prosecco and soft drinks. There will be great food, quizzing, music and maybe even some dancing! We always appreciate the support. Money raised goes to help support our local scouts activities. Kilmacolm Scouts. Doors open at 7pm. £10 Sa t 3 Ma r c h RIPPED UP by ReMode University of the West of Scotland, Student Union, Storie Street, Paisley PA1 2HB 7pm to 9pm A group of Renfrewshire teenagers will be hitting the catwalk this spring with a very different look. The models walking the runway at fashion show Ripped Up by ReMode will all be wearing clothes they’ve re-made from discarded fabric, whether donated or rescued from landfill sites. Tickets at the Eventbrite link: https://tinyurl.com/remode-ripped - £2 suggested donation Sa t 3 - Sun 4 Ma r c h Binocular & Telescope Open Day RSPB, Largs Rd, Lochwinnoch 10am to 4pm Saturday 3rd & Sunday 4th March Come and peruse a range of telescopes and binoculars, with knowledgeable staff on hand to help you find the right one for you! Our optics are competitively priced, with the added bonus that you are helping conservation. Cost: FREE Book Fayre Weekend Accord Store, 110 Abercorn St, Paisley PA3 4AY 10am to 4pm Thousands of books and cd’s for sale – all genres. Refreshments will be available. Saturday 3rd from 10am and Sunday 4th from 12noon BCU 3 Star Sea Kayak Clyde Muirshiel Regional Park, Calder Glen Road, Lochwinnoch Take your kayak out on open water, more challenges await. T n T B i r d R i n g i n g Demonstration The Cut Visitor Centre, Cornalees Bridge, Greenock A chance to see our native woodland birds up close and literally ‘in the hand’ while they get their identification rings. WHERE: Sat 3rd Greenock Cut Visitor Centre Sun 4th Muirshiel Visitor Centre WHEN: Sat 11am – 3pm, Sun 10.30am – 3.30pm MORE INFO: tel 01505 614 791 in office hours Sun 4 Ma r c h Mothers Day Gift and Craft Fayre Kilbarchan Guide Centre, Barn Green, Kilbarchan 1pm to 4pm Come along and browse our fantastic local crafter stalls. More than 20 to choose from; jewellery, soaps, art work, sweets, cards, books and much more... Something for everyone! We would love to see you there! All funds raised will go towards World Challenge Bolivia. Adults £1.50 Children £0.50 deadline date for our april issue - Friday 16th March - You don’t want to miss it! !